Coca-Cola FEMSA is the largest public bottler of Coca-Cola products in the world in terms of sales volume, accounting for one of every 10 Coca-Cola products sold globally. Through a network of over 2.9 million points of sale, the bottling company provides more than 100 beverage brands to close to 346 million consumers in nine Latin American countries and the Philippines. Our client works closely with The Coca-Cola Company (TCCC) to design and deploy a portfolio of beverage brands and packages that cater to individual market dynamics and stimulate demand among a growing base of consumers. In Argentina alone, Coca-Cola FEMSA has more than 77,350 points of sale serving almost a third of the population (13 million consumers). Due to an increase in production volume, the Alcorta plant needed to increase its wastewater treatment capacity. Its existing conventional WWTP wasn’t suited for expansion. Furthermore, higher corporate water consumption standards motivated FEMSA to consider reuse applications. An AirLift™ ultrafiltration system was designed to treat wastewater with up to 15,000 mg/L of mixed-liquor suspended solids (MLSS), and with a food to microorganism (F/M) ratio of approximately 0.2 kg COD/kg TSS. The system includes two trains of Pentair AirLift™ membrane bioreactors (MBRs) in parallel configuration with an area of 33 m3 per module. Each train can be expanded with the installation of two additional membrane modules. The piping and the skid were constructed in AISI 304 stainless steel. Based on Coca-Cola FEMSA’s requirements, the system was constructed and delivered in 75 days. Fluence technicians and engineers commissioned the project, which included the stabilization of active biological sludge media, in just 15 days. Fluence also provided training sessions for Coca-Cola FEMSA personnel. With the MBR system, supplied by Fluence in collaboration with ICR, the Alcorta Plant was able to adhere to Coca-Cola’s proposed 2015 standards. The implementation of the MBR technology allowed the conversion of an existing sequential bioreactor (SBR) to a Continuous Bioreactor (CBR) with a membrane clarification stage (AirLift). The final system reduced the footprint needed to install a conventional treatment system, while still being able to handle high sludge concentrations. 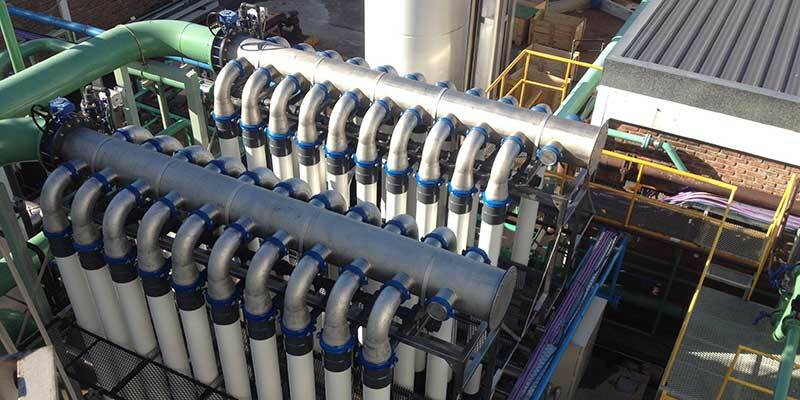 The system produces clarified water for reuse as industrial water.